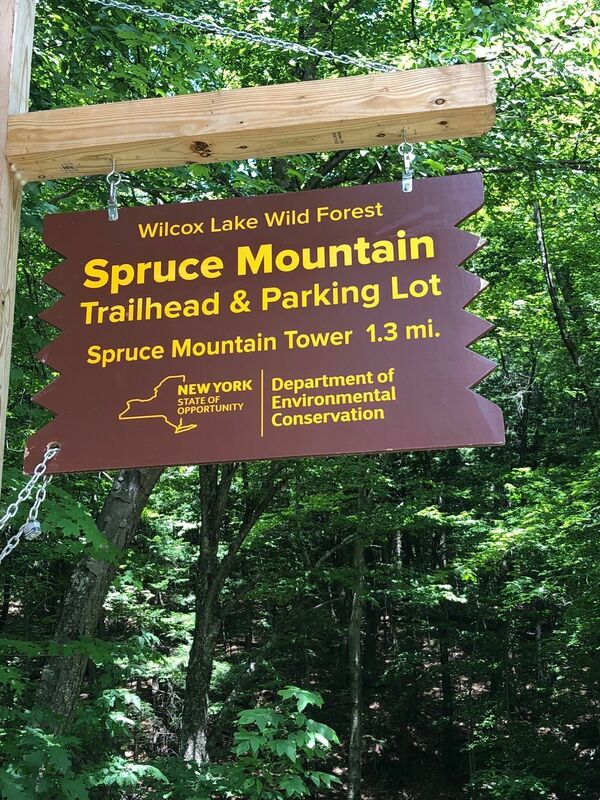 Spruce Mountain Firetower [PRIVATE PROPERTY] is a 3.1 mile moderately trafficked out and back trail located near Porter Corners, New York that offers the chance to see wildlife and is rated as moderate. 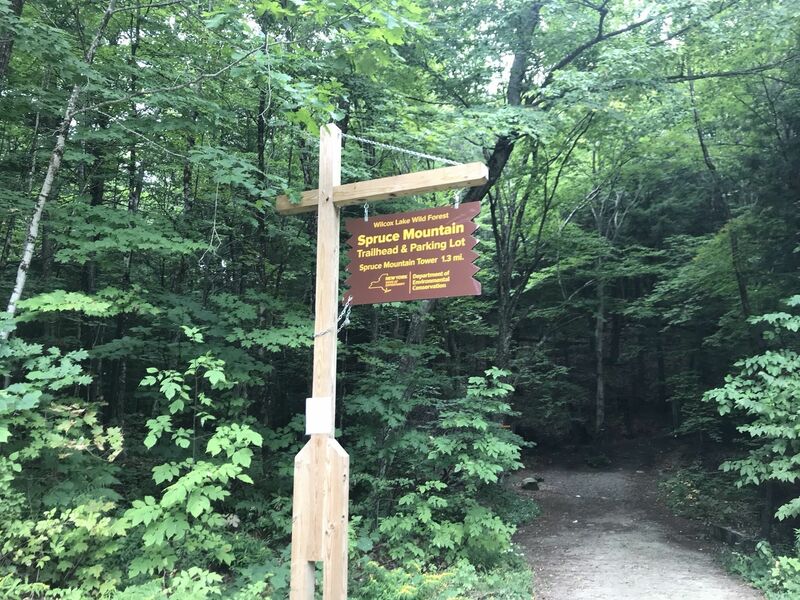 The trail is primarily used for hiking, nature trips, and snowshoeing and is best used from April until October. Dogs are also able to use this trail. 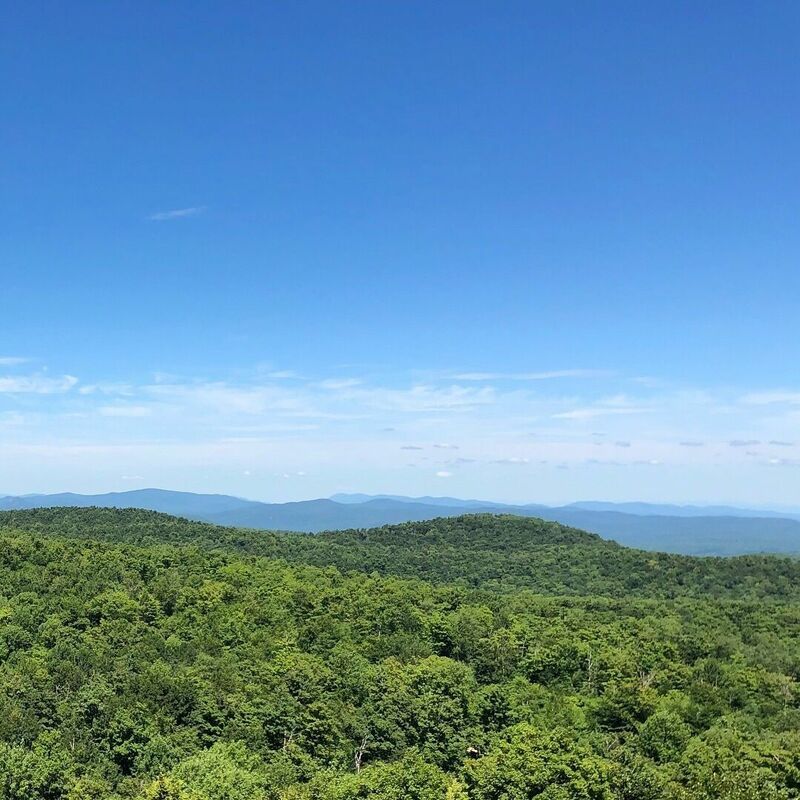 Small hike to the firetower summit. 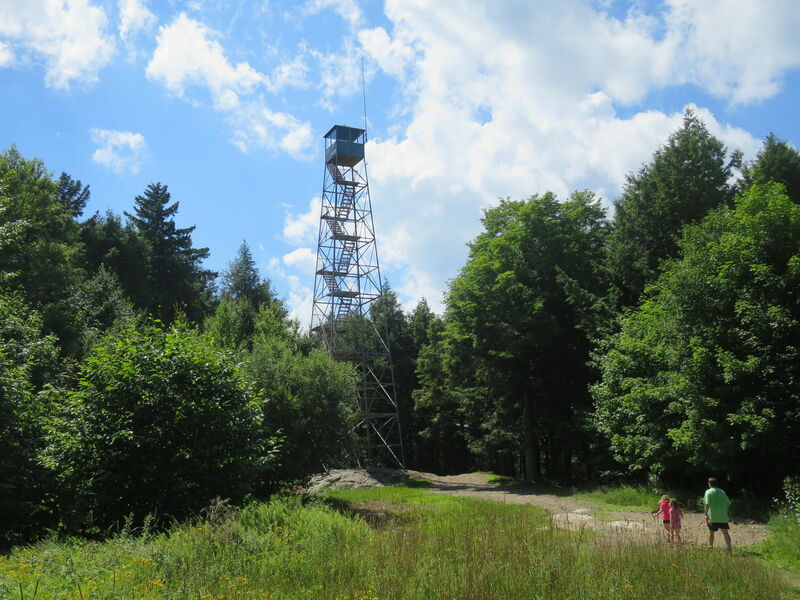 The 73 foot fire tower on the 2009 foot summit of Spruce Mountain was built in 1928 and manned until 1988. 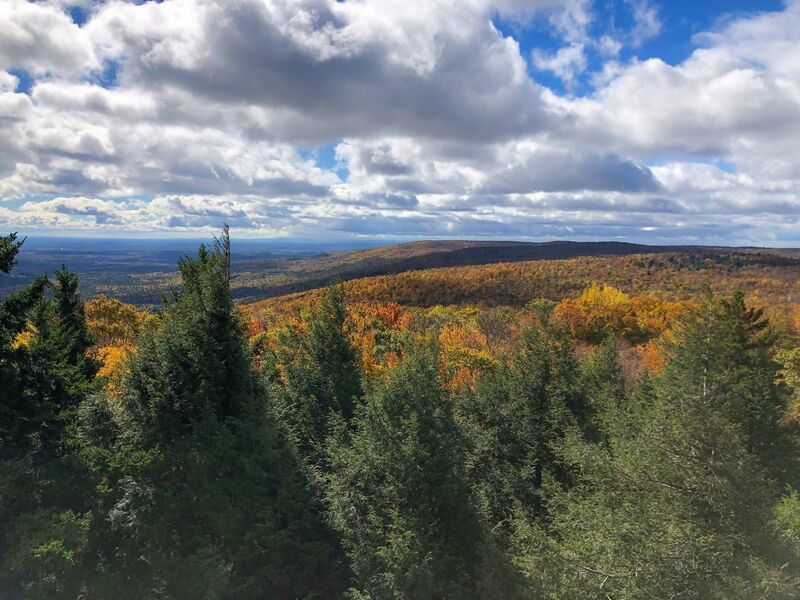 The summit is accessible by a gated service road and a 1.2 mile hiking trail. The trail has downfall and the remains of past logging operations. This area was heavily logged in the past. The trail crosses an old concrete culvert over a stream then immediately climbs. The total elevation gain 1000 feet over this 1.2 mile hike. 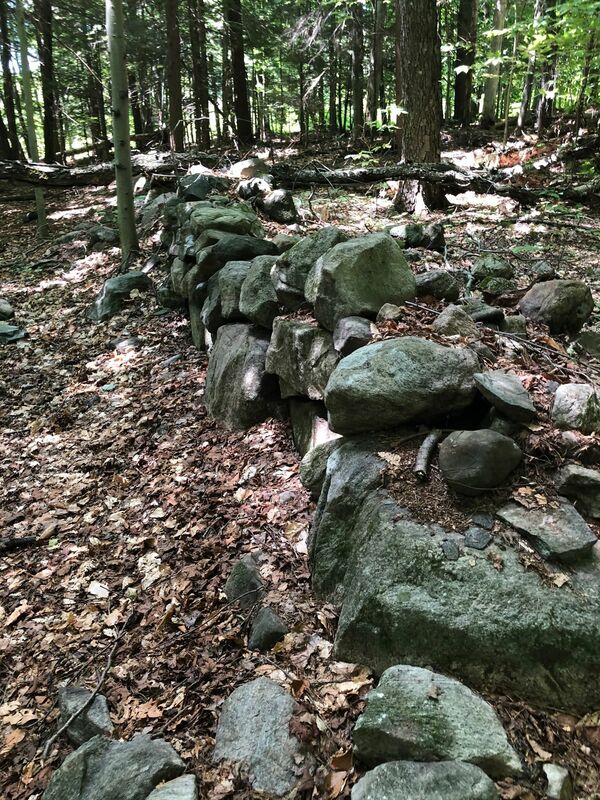 The trail can be tough to follow at times with many old logging roads crossing the trail. The trail is marked sometimes with red DEC discs. Tough to follow in winter - sled trail runs west of DEC trail to summit, slightly longer. 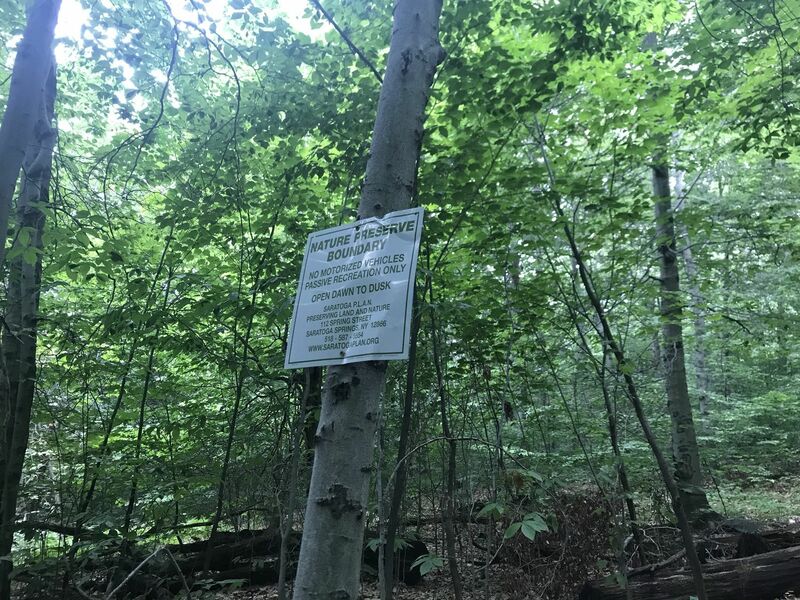 The trail crosses land used by the Blue Jay Hunting Club on a lease from International Paper, so hiking is not recommended during hunting season (late September through early December). 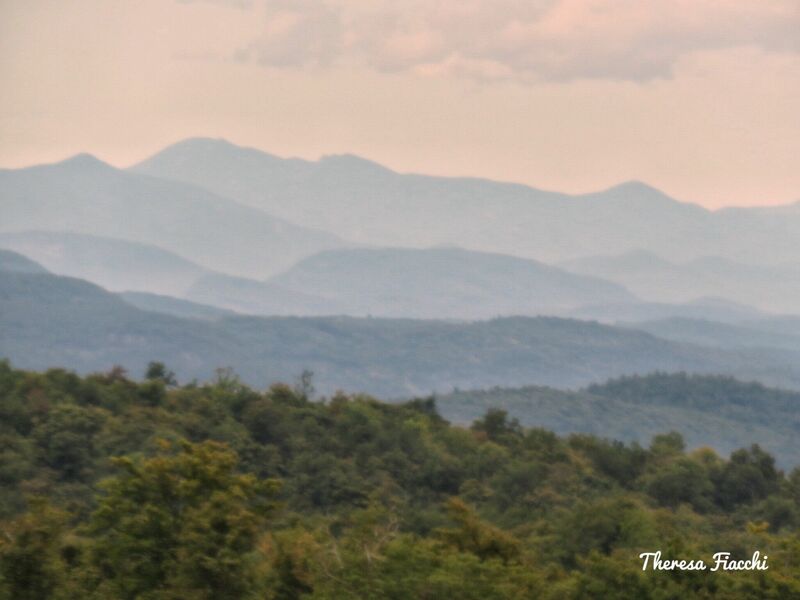 From Saratoga Springs, NY, head north on rte 9N towards Corinth. 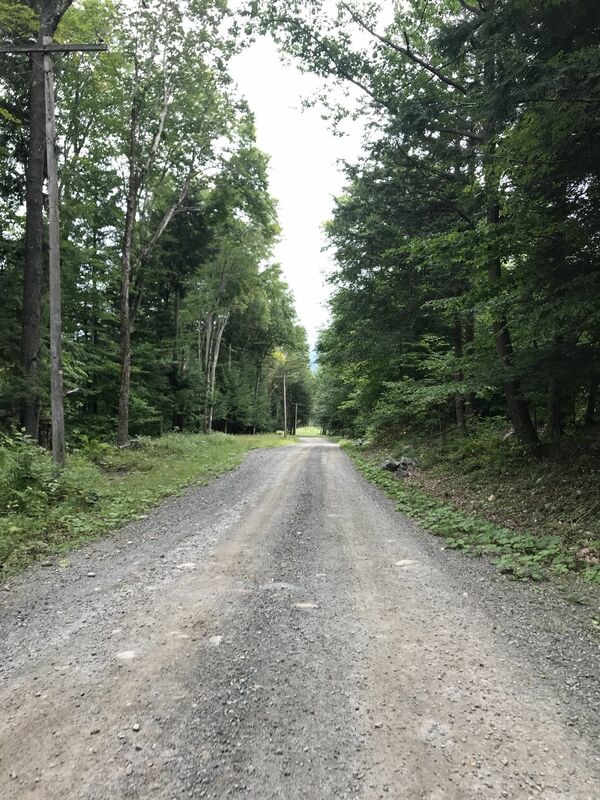 Shortly after passing through South Corinth take a left on Wells Rd., Drive this road for a few miles until it T's, take a right on Spruce Mtn. Rd (Not Signed) and just a few hundred yards down this road there will be a dead end sign, pass the gated entrance to the fire tower access rd on the left, and proceed to a parking area marked with a NO PARKING SNOWPLOW TURNAROUND, and this is the unmarked trailhead to Spruce Mountain. Quick hike. Lots of mud and ice doable with or without spikes. Rainy so no views. Will need to come back. completed this morning. 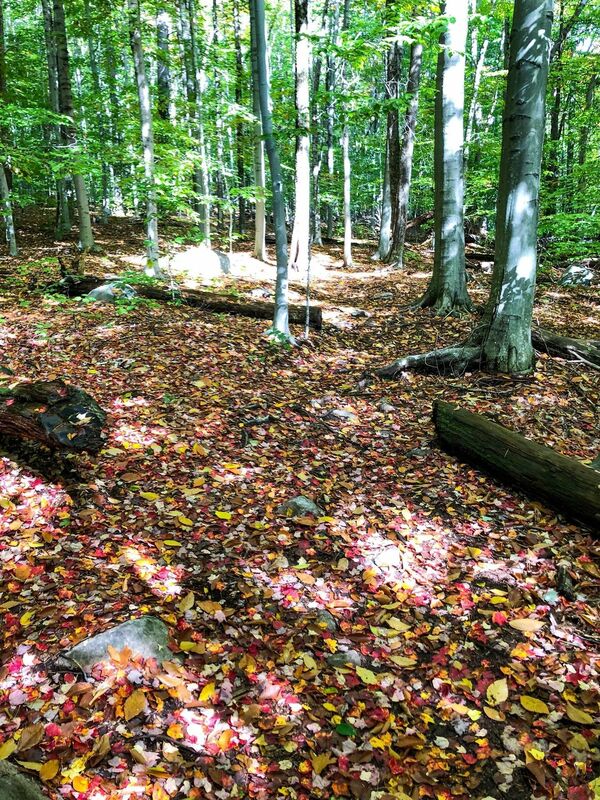 super easy to follow the trail markers even though with all the fallen leaves the trail wasn't clear. icey and snowy is some spots. super muddy but an amazing hike!! A lovely trail and pretty well marked. the colors were brilliant today! the trail is not too difficult but it did have a few spots that had me working hard to keep going. 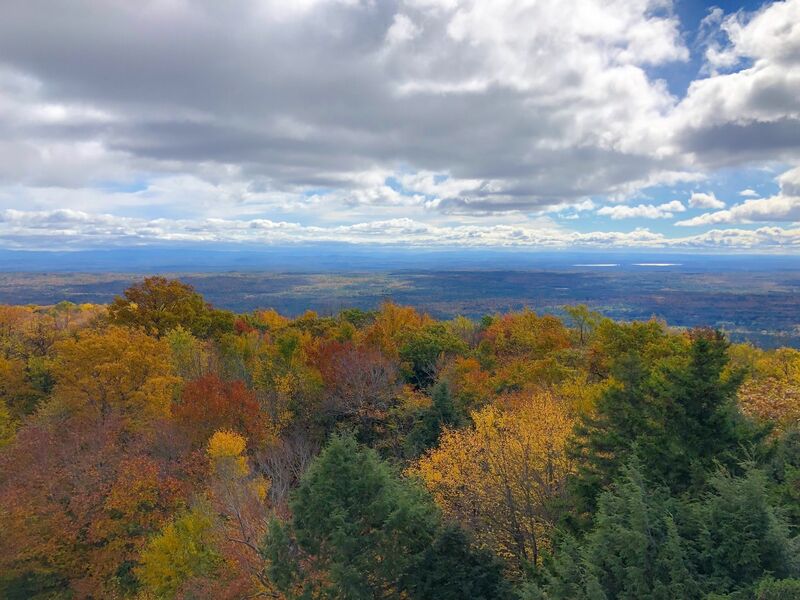 The firetower was wonderful! 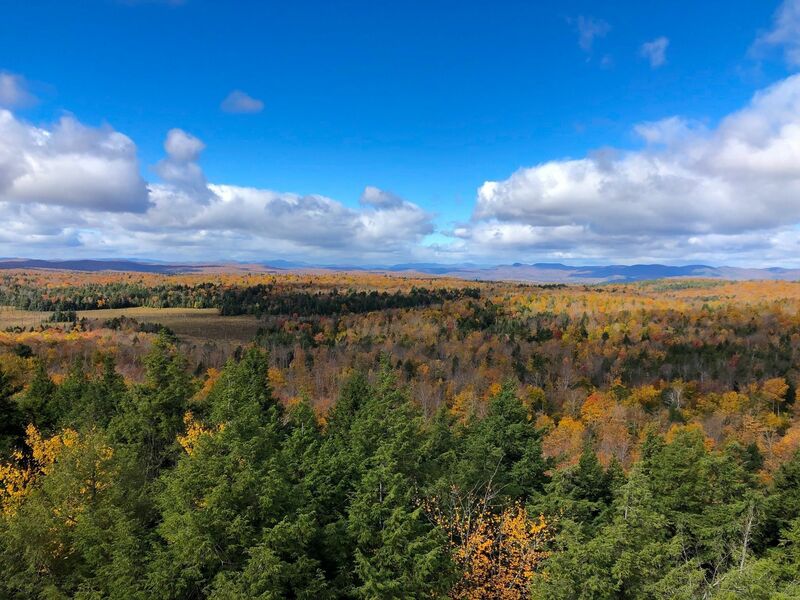 The views at the top of the tower are terrific, not sure how much longer the fall foliage there will last with the high winds but if you can get there in the next day or two its a worth while trek. 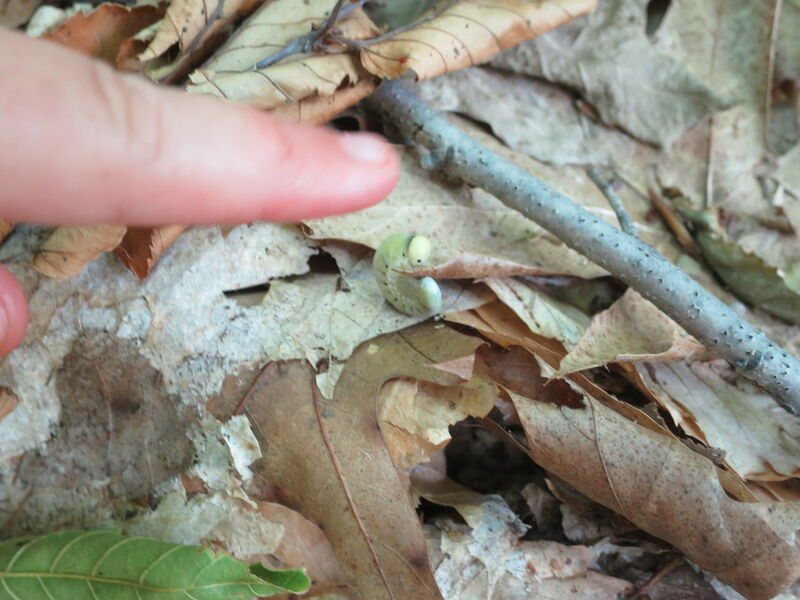 I uploaded my foliage pics. I think Timothy is reviewing the wrong mountain. 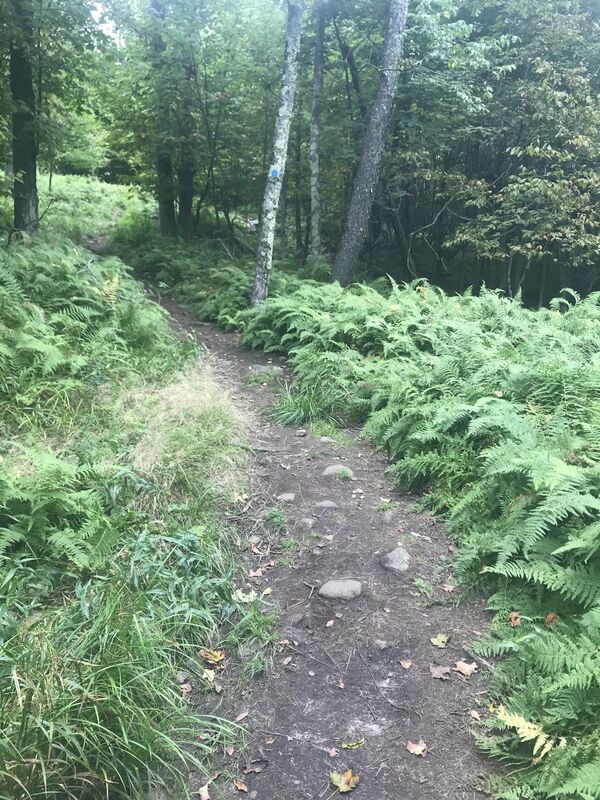 There is nothing difficult about this trail (my 5 year old could do this twice easily) unless you are in bad shape. As far as mountains go I would say its actually on the easier side (easy I think is reserved for those flat short hikes). It is a little muddy at the moment but if you are wearing hiking boots you will hardly notice. I was up, took pics and down in under an hour (I jogged down). 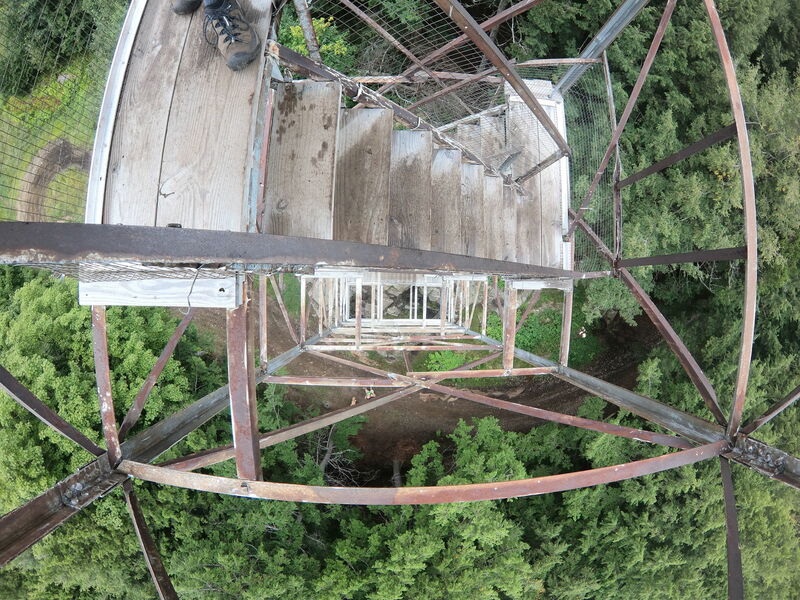 As others said there isn't much to see until you actually climb up the firetower. 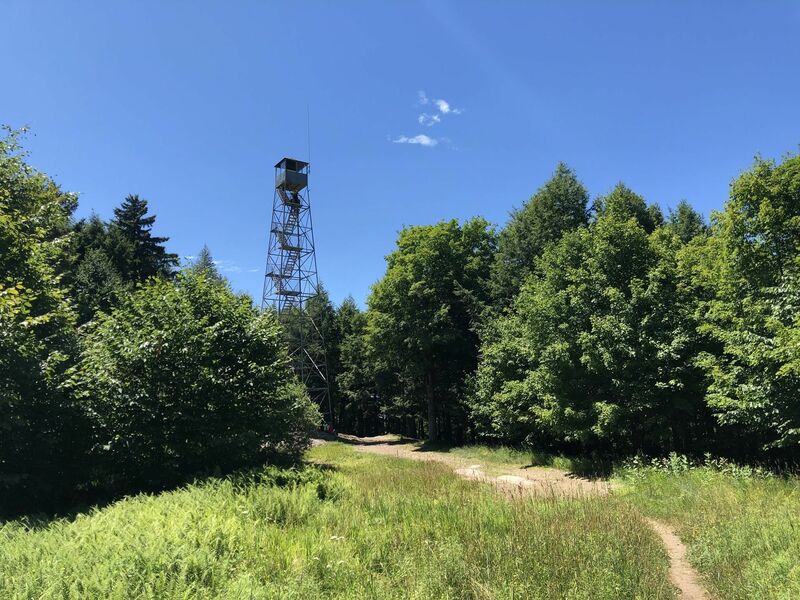 For most of us who are doing the firetower challenge, we are not experienced seasoned hikers ( those are the 46 er group) this is NOT an easy hike. It’s not hard,but has some steep inclines and is fairly long. 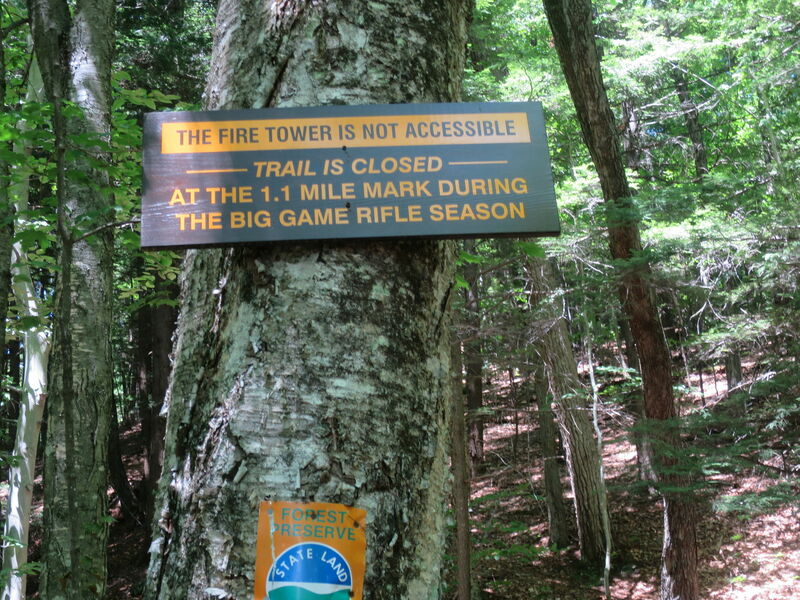 It’s a very nice trail but the firetower is locked at the top and not much of a view from the ground. 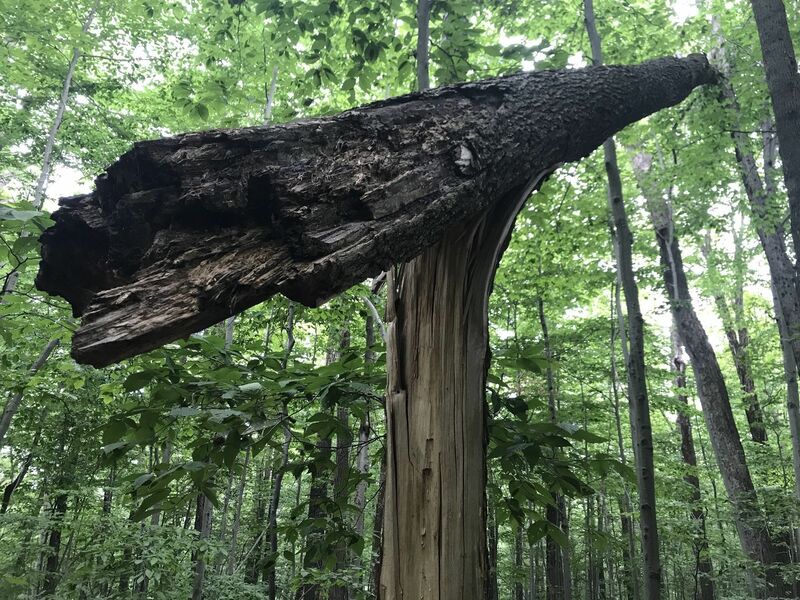 There is one spot where a large tree is blocking the trail , walking around it can be challenging if it’s wet, hopefully it will be removed soon. 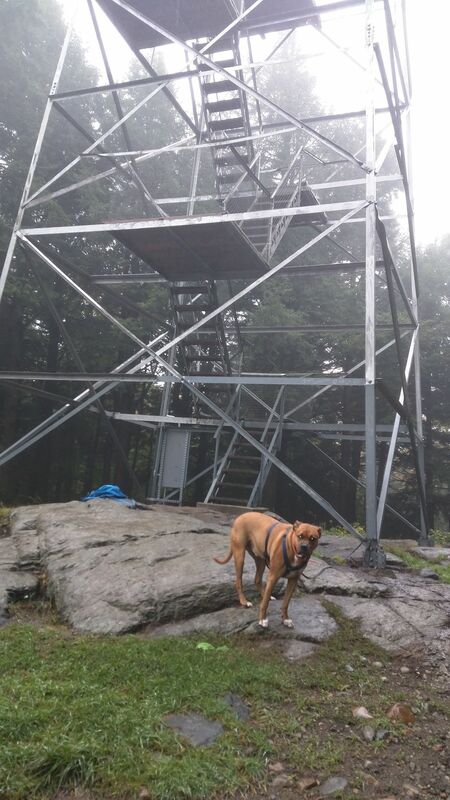 Did a nice leisurely hike with my 11 year old for the Fire Tower Challenge on a rainy afternoon. The trail was clear and easy to follow. The fire tower was locked but we hung out underneath and ate lunch. 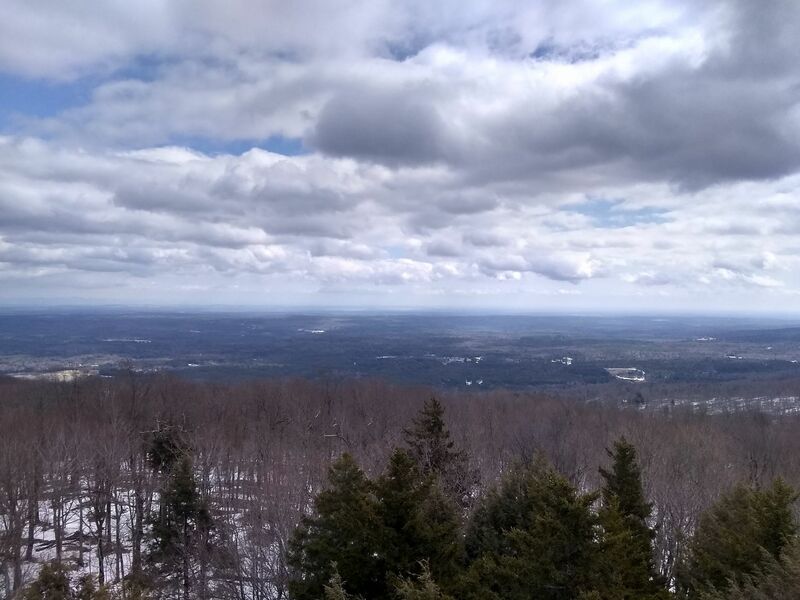 It took us two and a half hours, including an hour at the fire tower. I will go back when the skies are clear so I can see the views. Pretty easy hike, well marked trail. Didn’t take too long to get to the top. 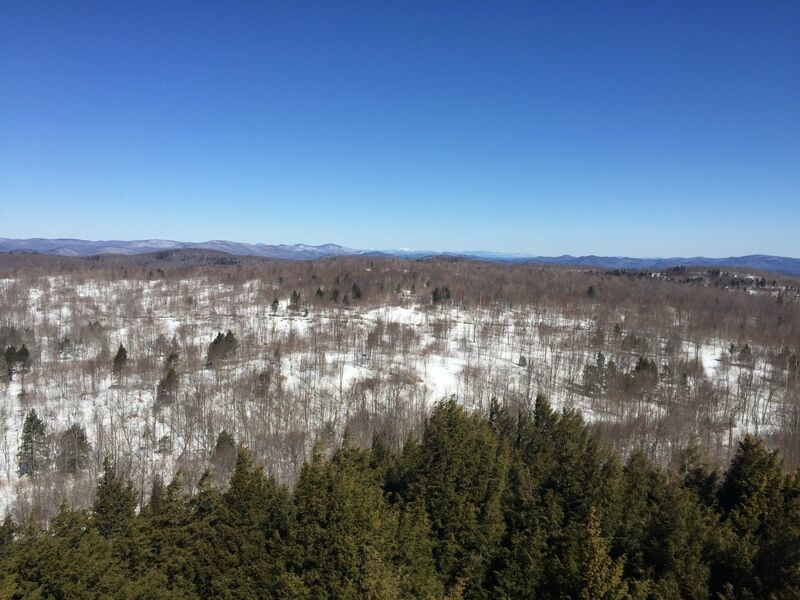 Good views, only from the fire tower, however! Probably won’t do again but we’re completing the fire tower challenge. 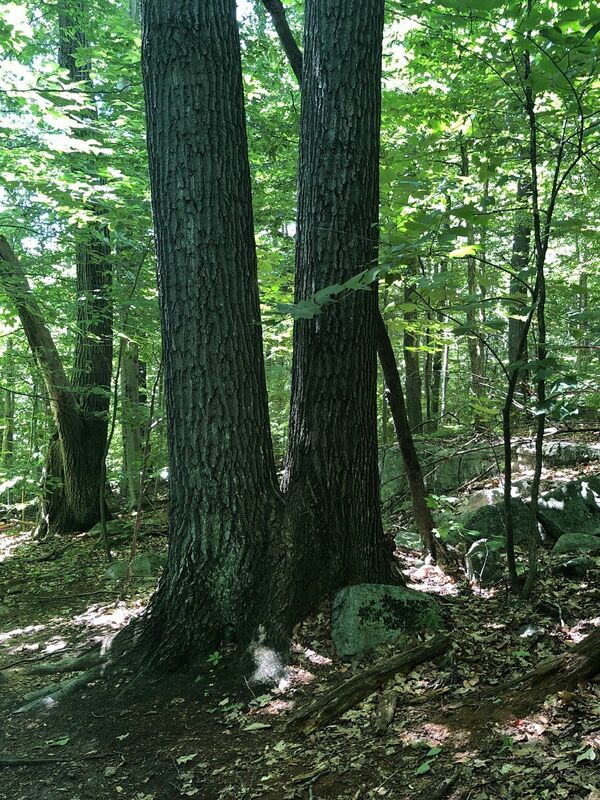 This hike is easy to moderate depending on your fitness level. 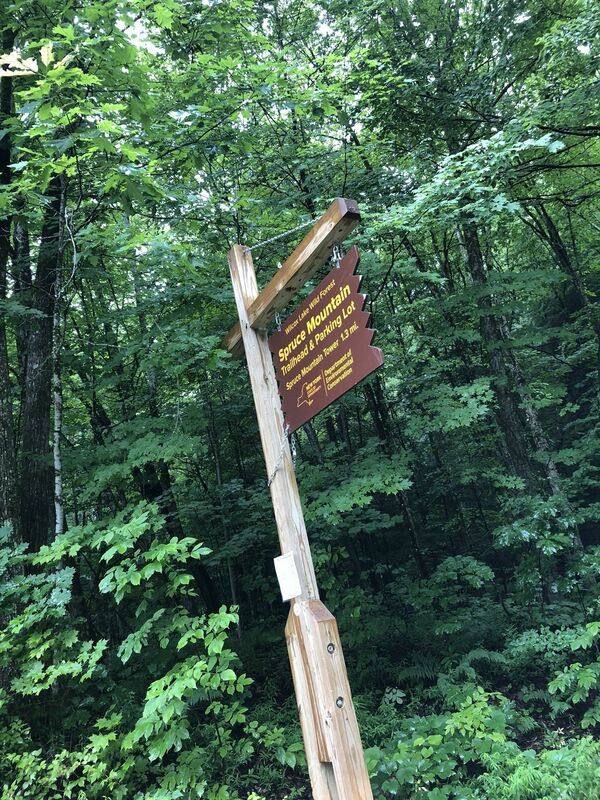 According to my pedometer app, it was 1.5 miles from the trail head to the fire tower. The path is well worn and quite easy to follow, and is marked with trail markers as well. It took as 45 min to go up with very little stopping. If you need to go at a slower pace, it may take a little over an hour ( going up). 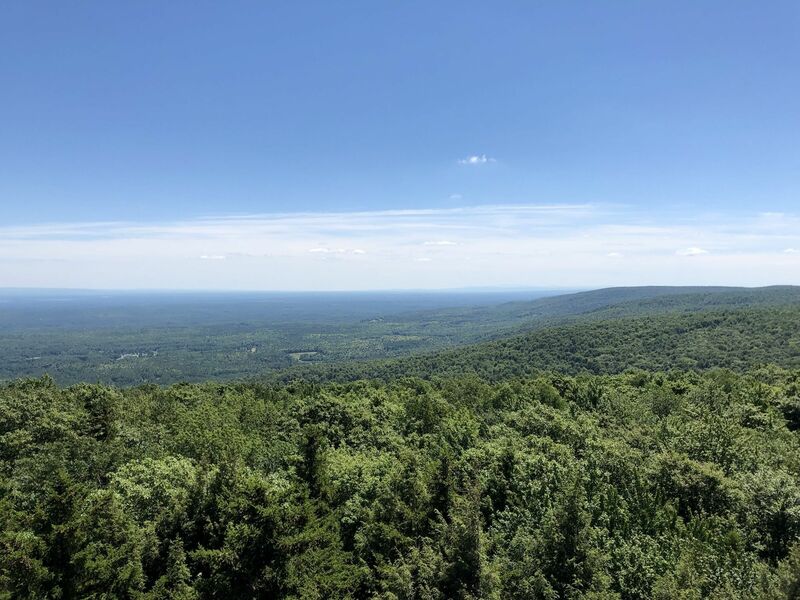 As for gear, we wore hiking shoes but you could safely use good sneakers..There aren’t many views of mountains until you climb the fire tower at the top- and WOW! Just beautiful! Trail was well marked and didn’t present many challenges. It was a nice quick hike. This was my wife’s first hike and she didn’t think it was too bad. 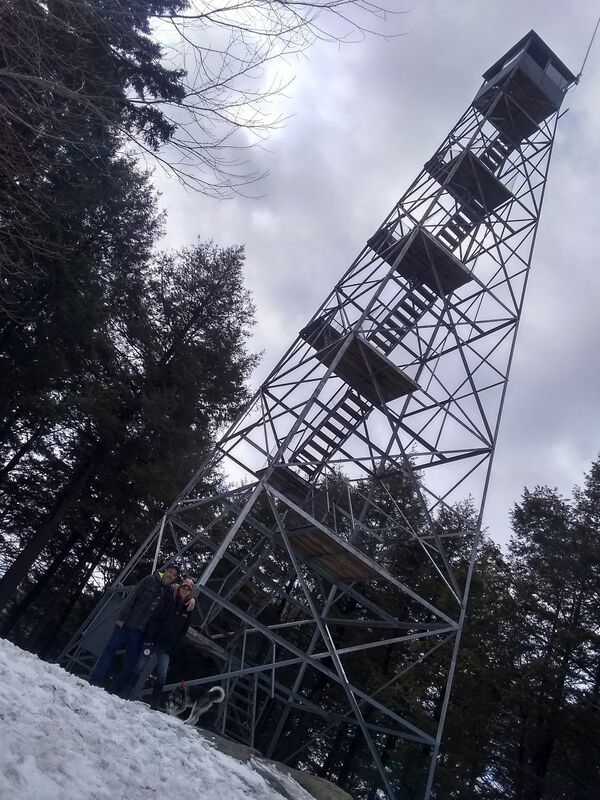 My son and I love chasing fire towers and we liked this one. The cabin was locked but we could hear the radio transmissions from inside. 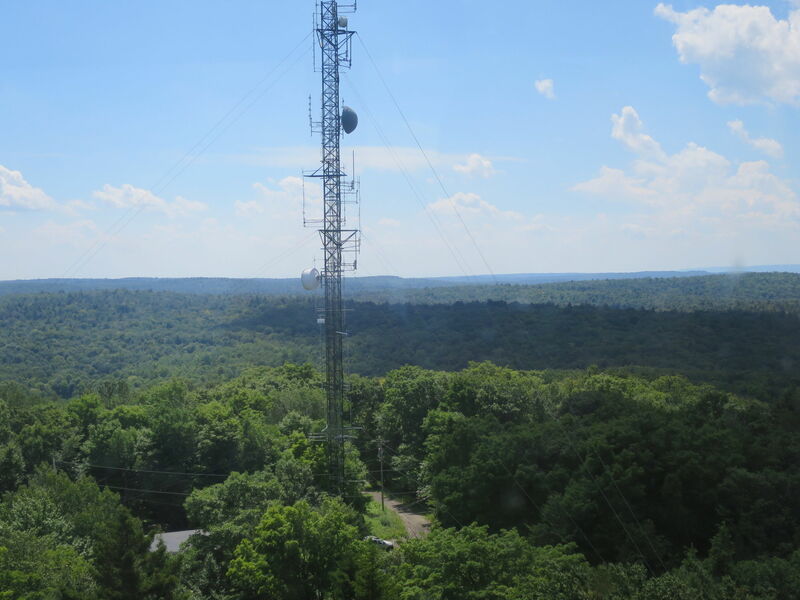 The views were great from the tower, no view from the summit without climbing up the tower. We picked up some garbage around the summit. Apparently LNT doesn’t apply to those who drink alcohol up there. 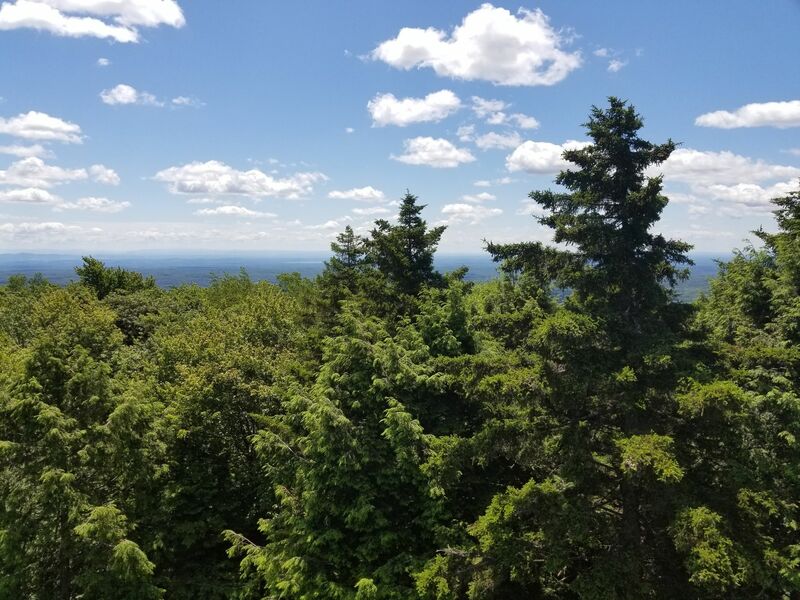 I found this short hike to the fire tower relatively easy. It’s a gradual ascent that is pretty easy to follow. 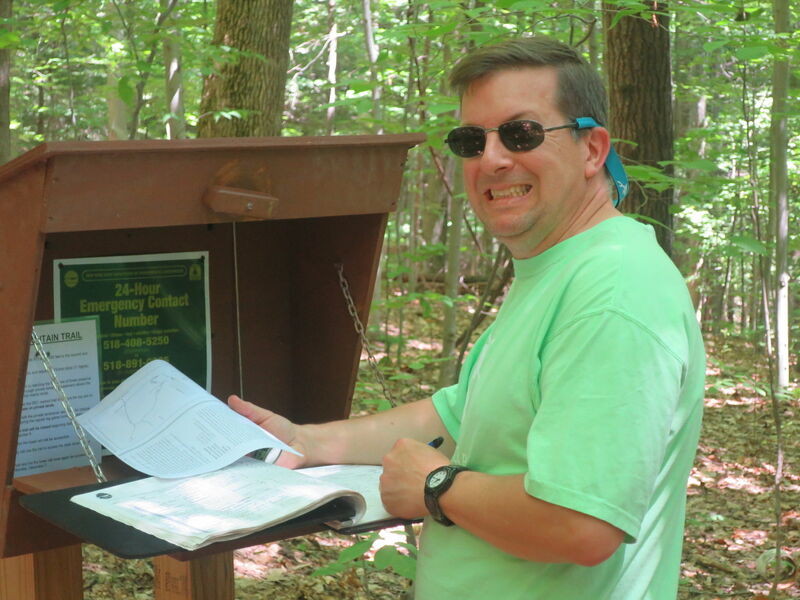 It took about 40 minutes to the wooded summit and 35 minutes back down. 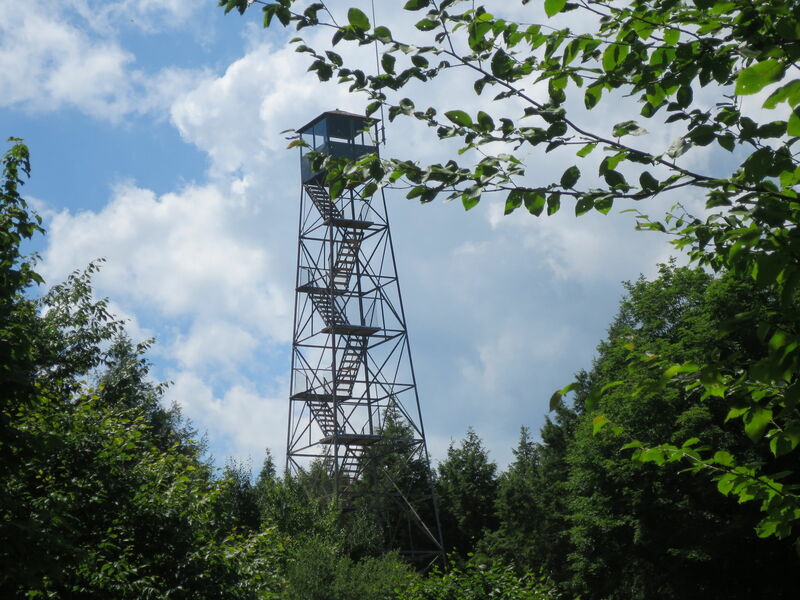 The fire tower is high and you’ll need to climb about halfway up before you get any views. If you make it to the top you will get a very nice view over the tree line. Decent amount of parking at the trailhead; GoogleMaps has it accurately located. 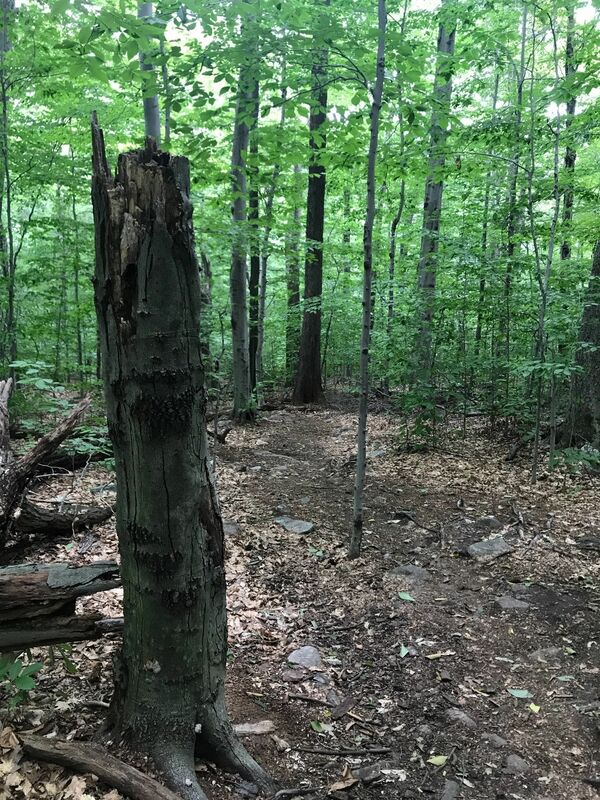 The trail itself is easy to follow, solid under foot, and clearly defined by the BLUE (not red as mentioned in the description) DEC tree markers. 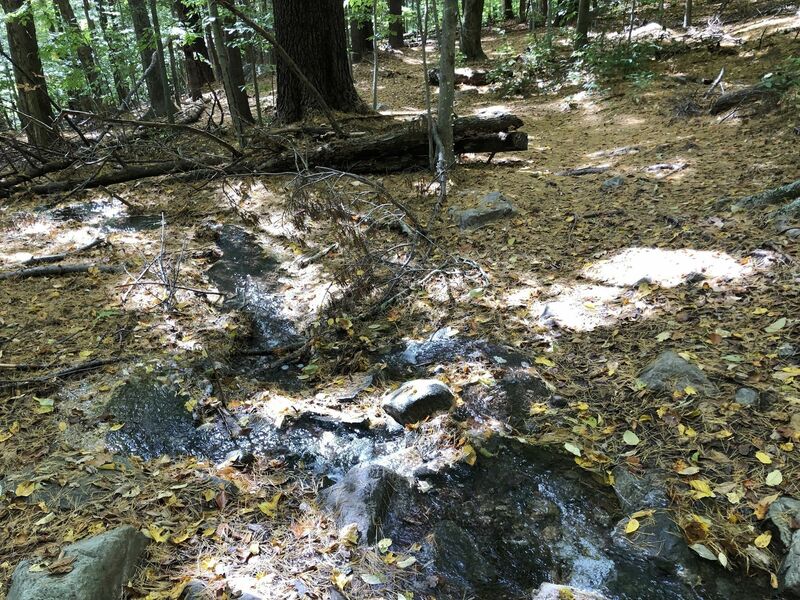 Its a steady uphill hike on a mixture of dirt-pack, exposed tree roots, and large rocks. We are active people and would rate this a light-moderate hike. 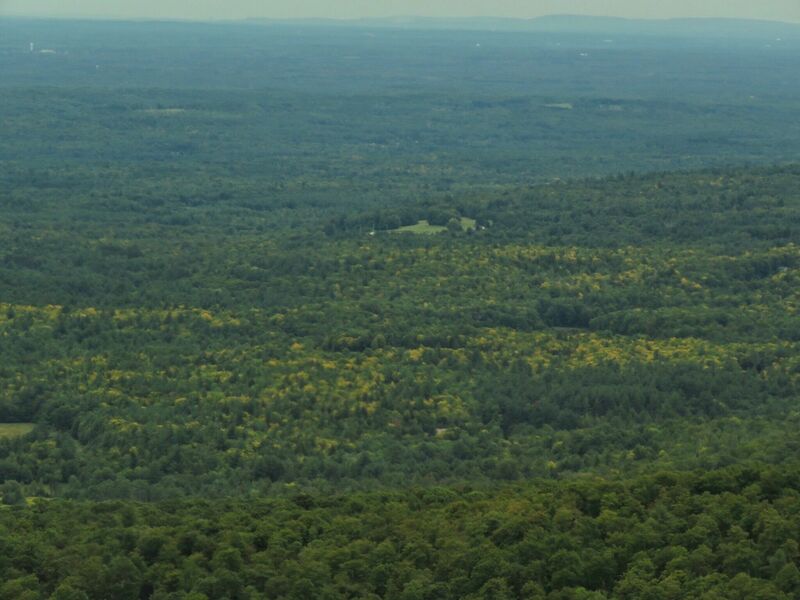 Tower was easy to ascend and offered decent views in all directions; Saratoga Lake was clearly visible to the SE. The descent back to the trailhead was easy to navigate, although a walking stick/poles will come in useful for those with bad knees. All in all, it as was great hike. Well marked; no views except from tower which is open. 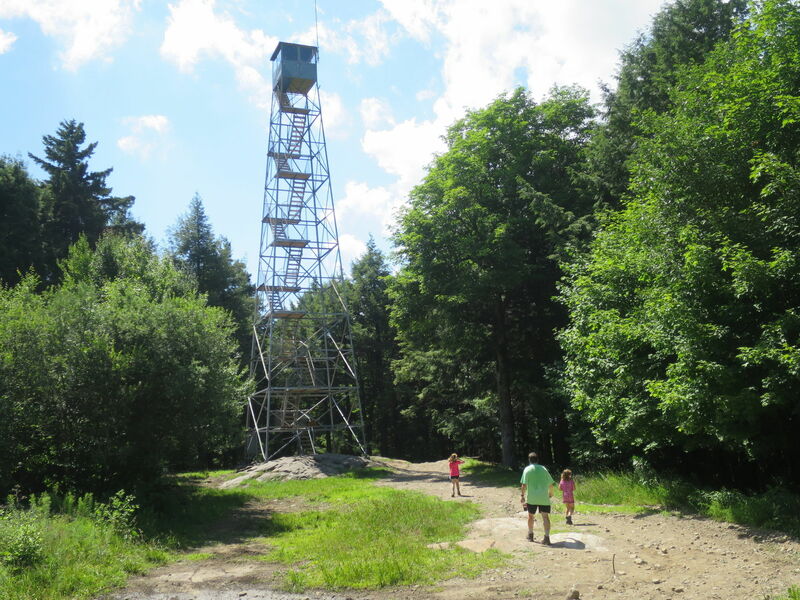 This trail is relatively short and easy compared to most other ADK towers. It was worth the hike. 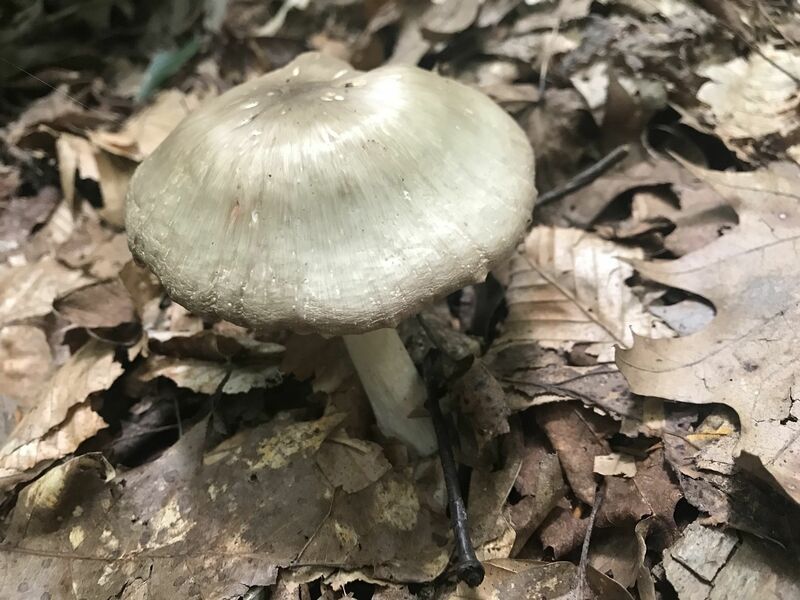 Check out my full write up along with pictures and things to look out for. 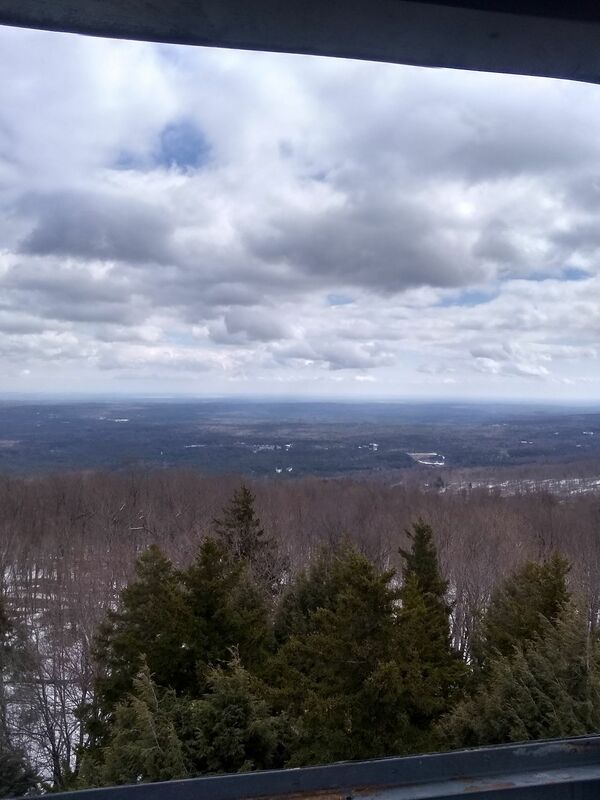 Nice steady climb that was challenging with a great view from atop the fire tower. Be brave and climb to the top! Our two sons (5 & 8) were able to make it with a handful of water breaks. 1.5 hours up and 1 hour down. Enjoy!!! Very wet hike through misty woods. Number 13 for the challenge! Well maintained and great directions. I’m sure there would have been a great view from the tower. 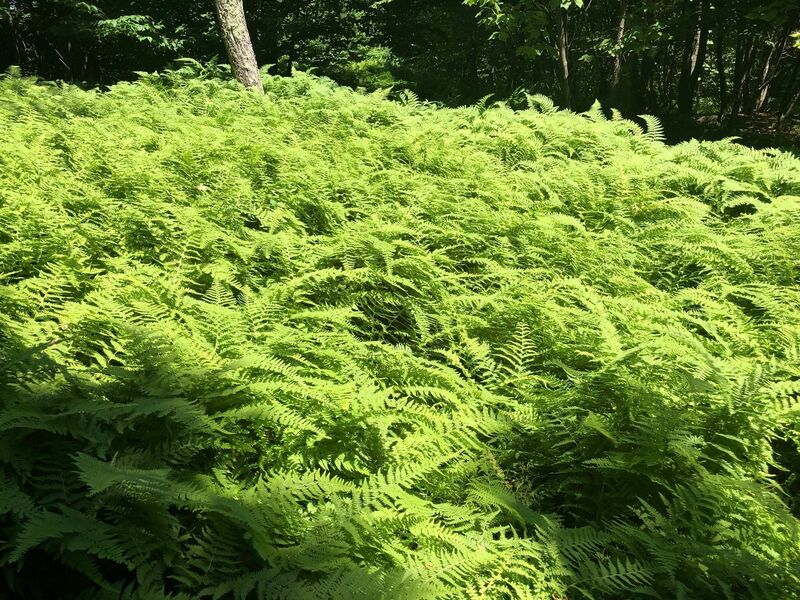 Dog loved the ferns! 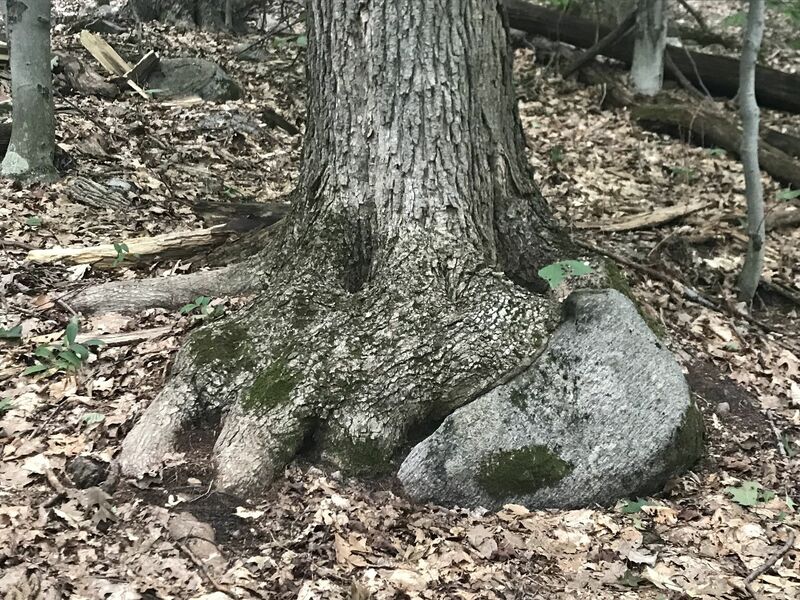 Trail is dry. Mostly uphill hike. 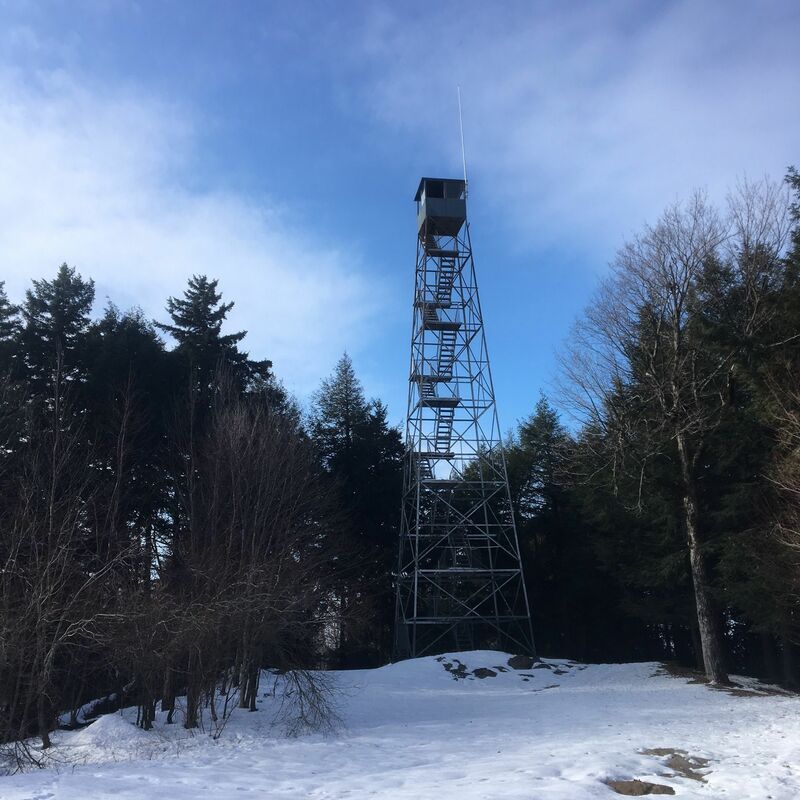 Top of the fire tower is locked. Nice trail easy to navigate some steep spots but nothing overwhelming. Hiked it July 22 and met just a couple others on the trail. Other than that, had the trail pretty much to myself. Lovely little trail. 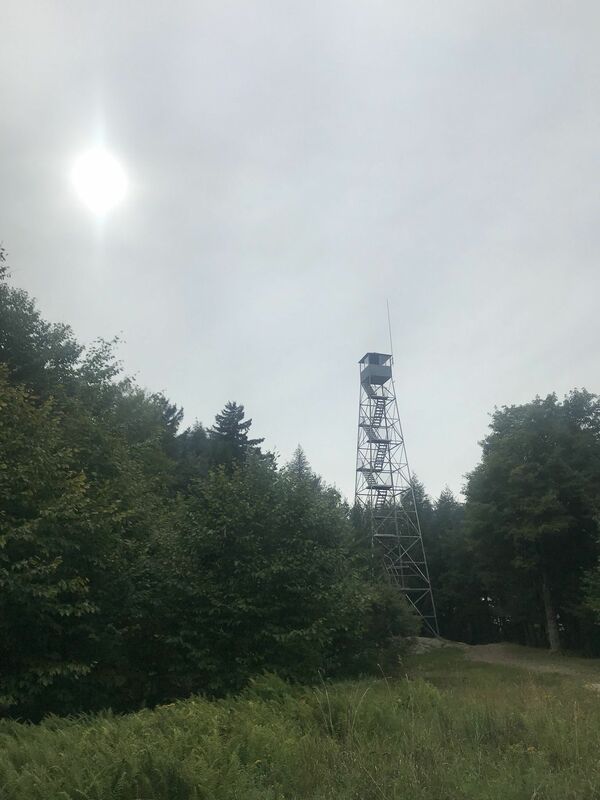 My husband and I hiked to the fire tower with our dog on a leash (a corgi) on Saturday, July 21. 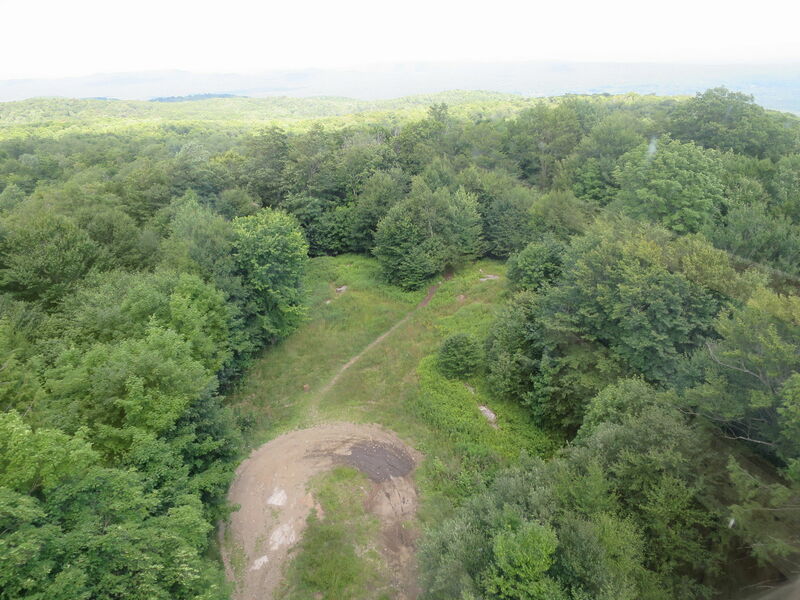 The trail was not muddy at all, and the view of the peaks from top of the tower was fantastic. Short easy/moderate hike depending on your fitness level. Never too steep and plenty of level sections to get a break. Well marked and the trail isn't too rocky or full of roots. 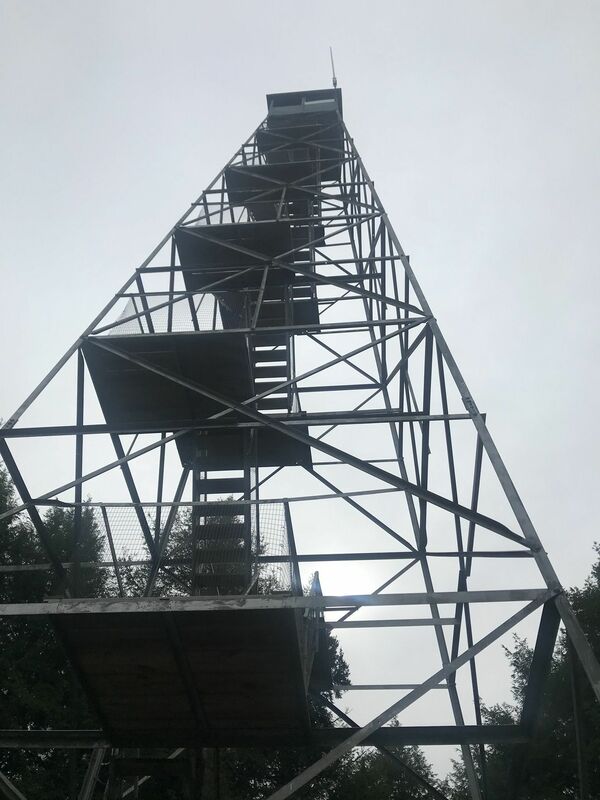 We did it to complete another fire tower for the challenge. Kids had no problem at all. It was a little buggy so bring bug spray. 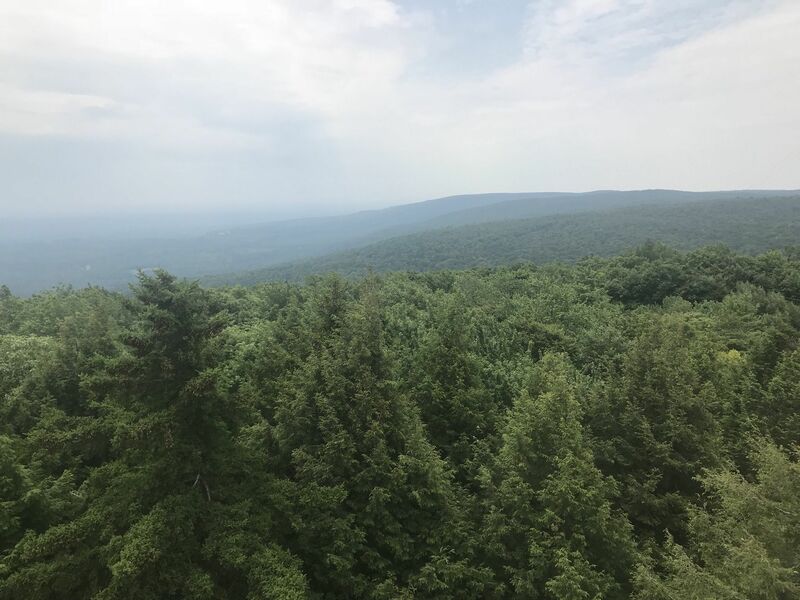 View from the fire tower was nice but you have to climb it to see anything. Too many hikers with dogs off the leash!!!!! 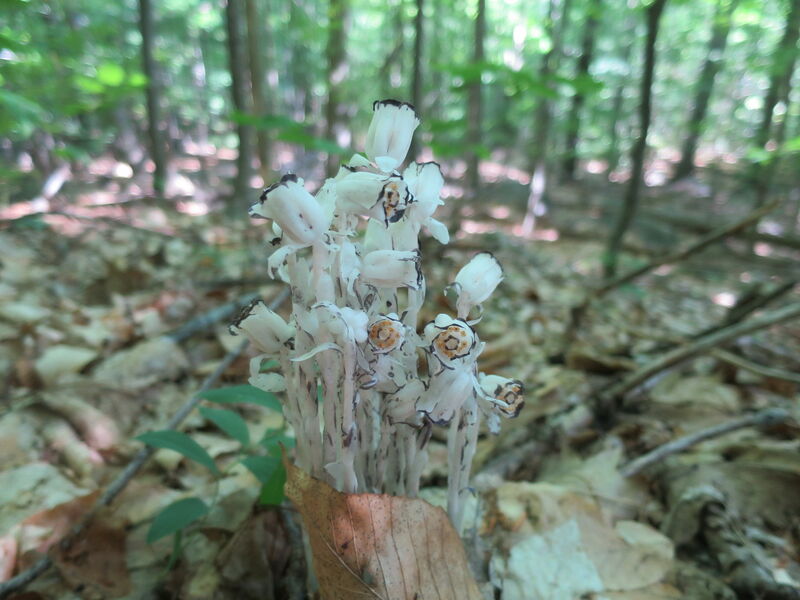 And way too many hikers not cleaning up after them. The first stretch smelled like it too! I'll never understand why others can't have a little respect for other people on the trail. Leash your dogs! 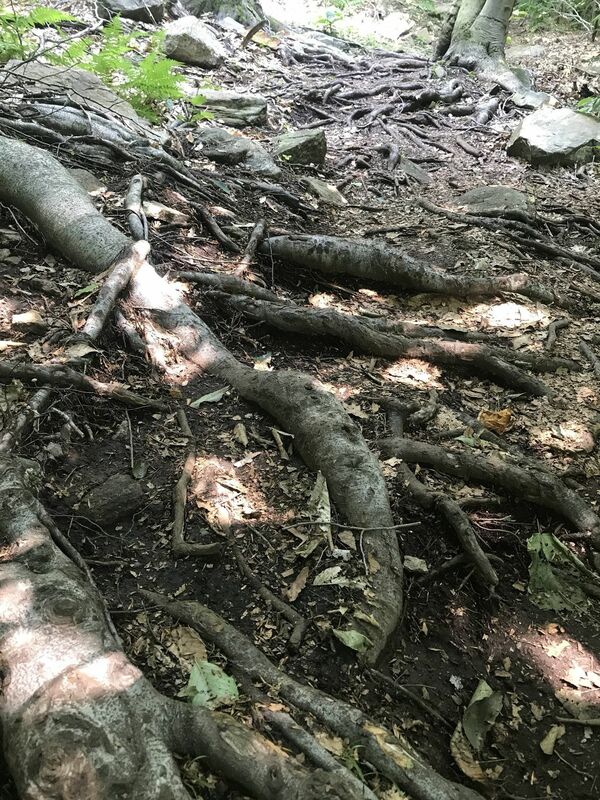 This was a quick hike, the trails are rough lots of rocks and tree roots. 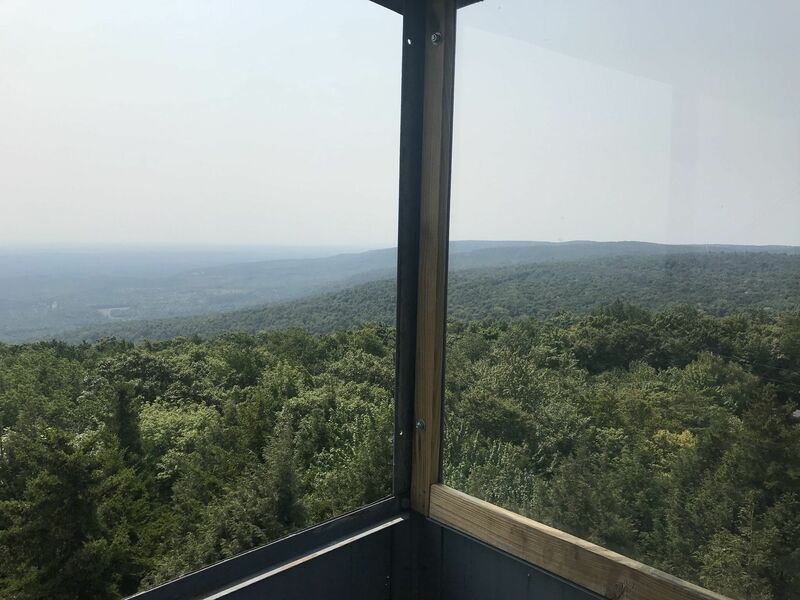 You can only see the view at the summit if you climb the fire tower. Not my favorite. But great for shorter hike. Short, fun hike. Not too challenging but we had a couple with us that was not fit and had some trouble climbing. Nice views from the tower along with a cozy spot next to tower with heavy shade and nice for picnicking. Took about 2-2.5 hours to finish and we took our time. 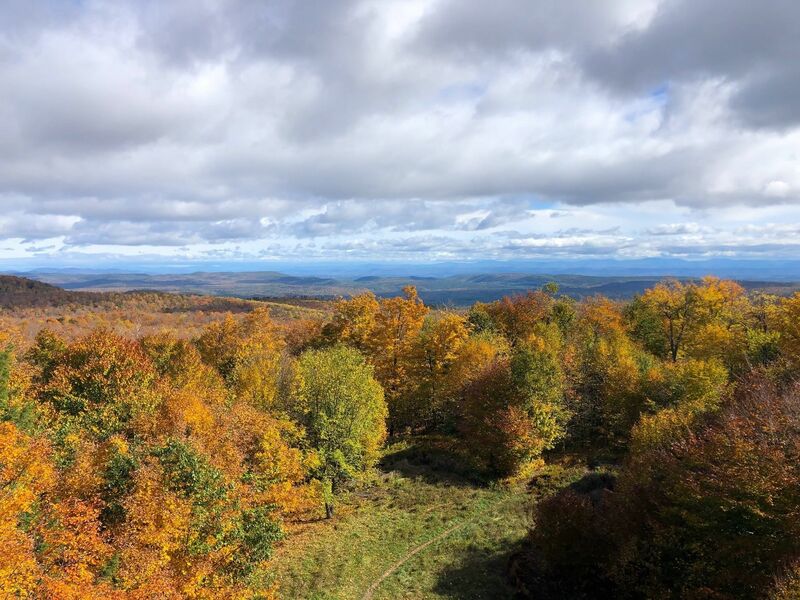 Nice hike, trail very well marked, great views from the fire tower! 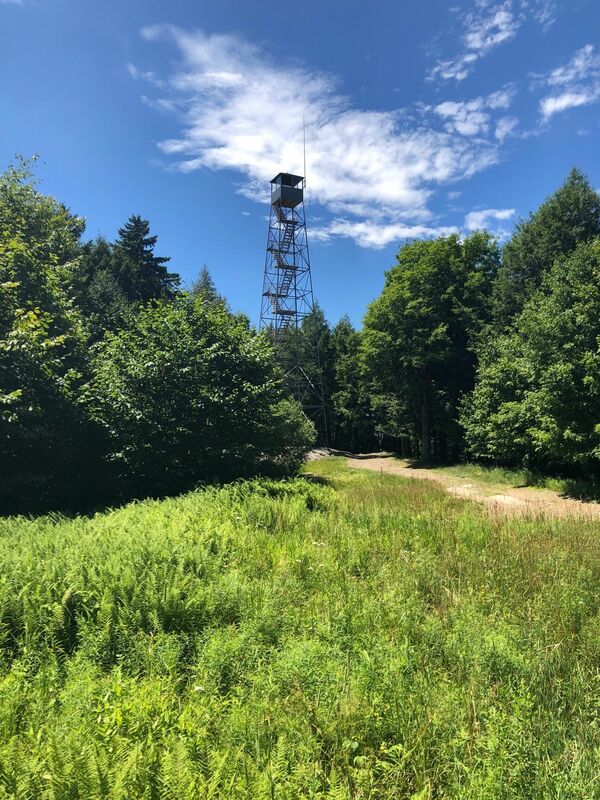 another easy hike and another fire tower hike down. we are slowly meeting the challenge. 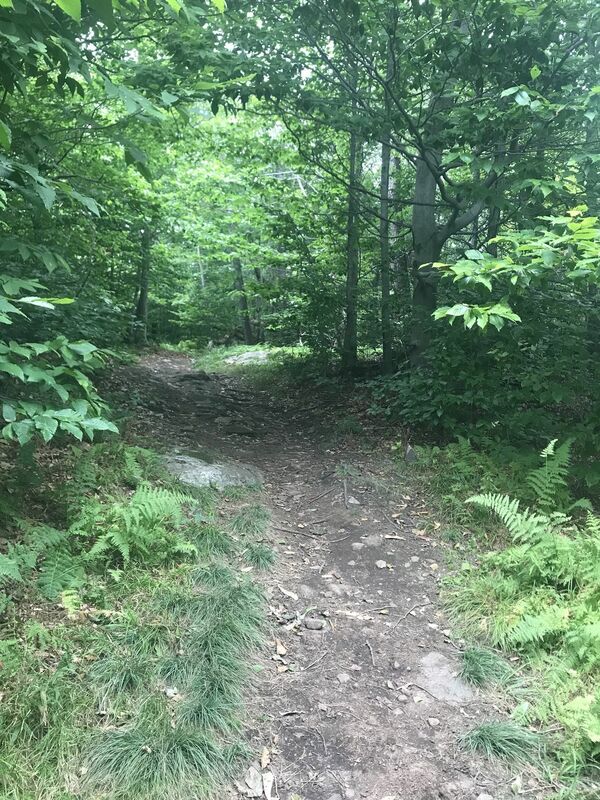 I hiked this trail on Saturday morning, June 23rd at around 8:30. There were a few people on the trail. It was overcast/drizzling with no bugs. 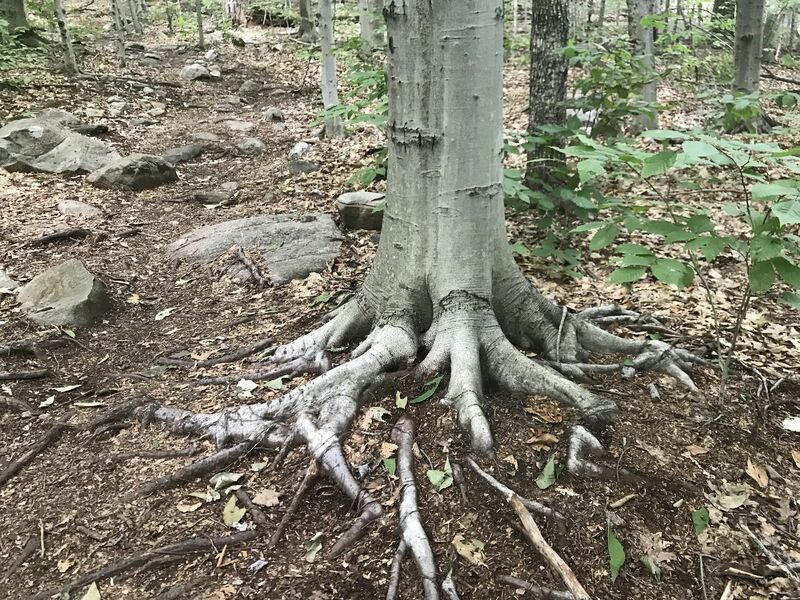 The trail is mostly dirt, rock and roots. So be prepared if you want to climb following heavy rains. From the parking area to the top of the tower (which was locked by the way) it’s about 1.52 miles. Ascent is about 1036 ft. 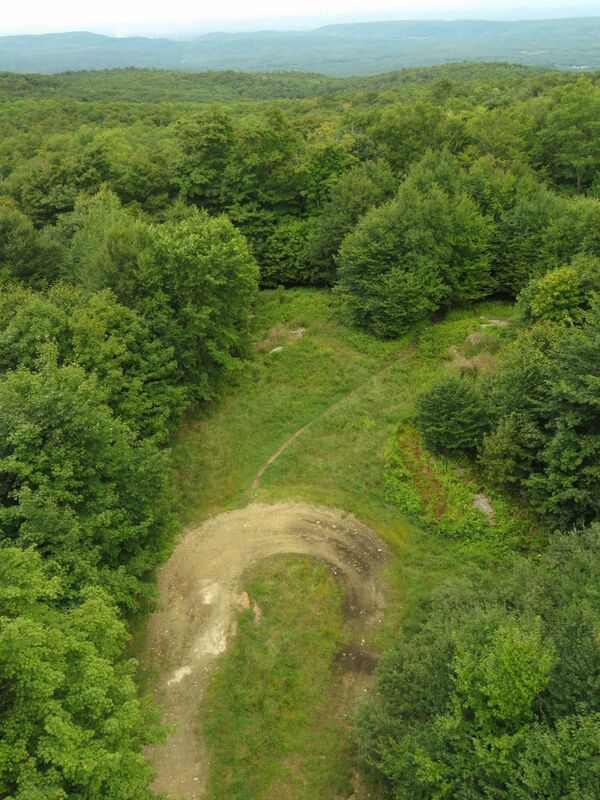 If you’re a novice this trail may be a challenge, but not impossible. If you’re an expert, it would be nice hour or so workout. 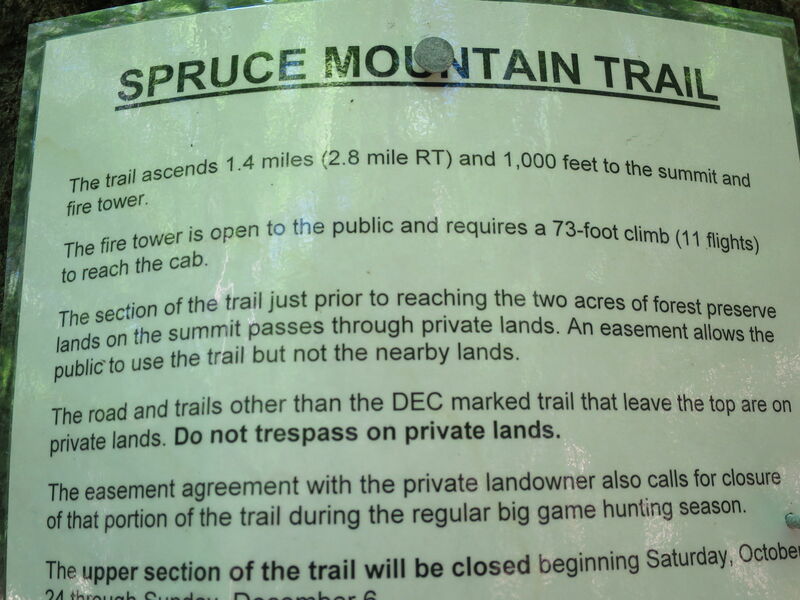 Pretty much what everybody else has said... this is a great trail for beginners that actually want to climb a little bit. 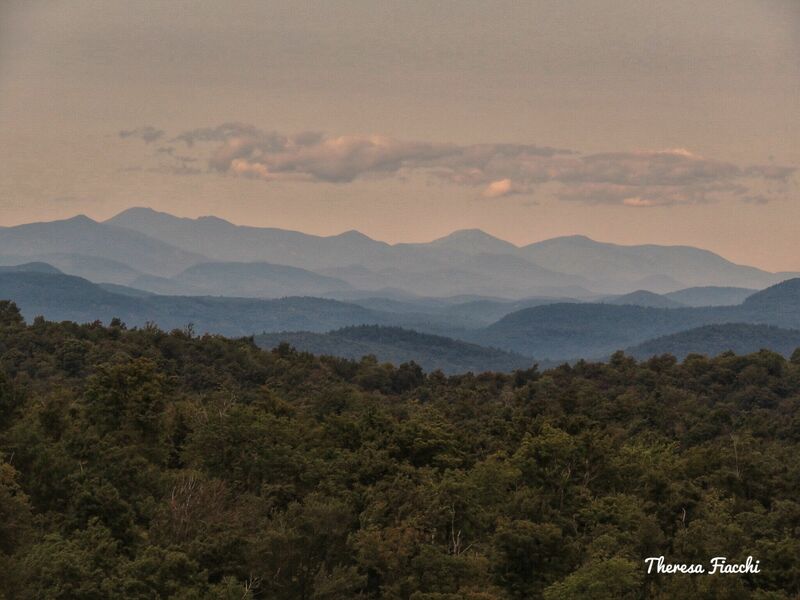 Decent views of the Lake George peaks from the firetower. Actual tower enclosure at the top was locked...bummer. Trail is impossible to lose and is soft and dirty. Moderate climb from the get go and never too steep, but someone that's never really hiked or is really out of shape might find this tough. Only took about 40 minutes to ascend to tower and that was with a couple short 2 to 3 minute breaks along the way. 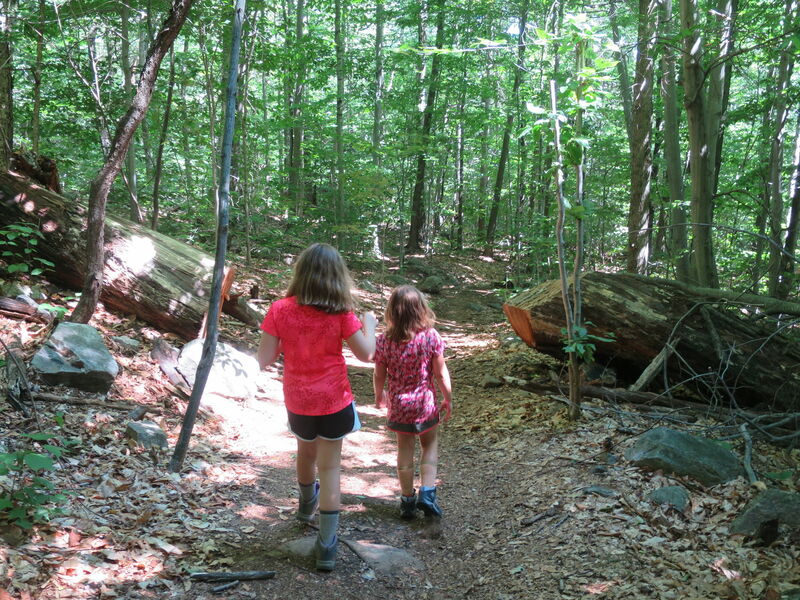 Expect to see others on the trail if the weather is good. 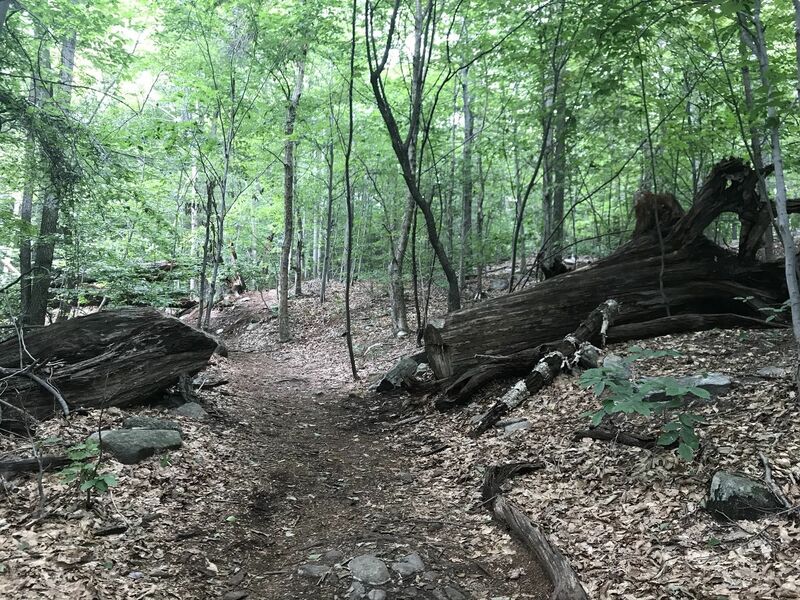 No bugs at all on 6/21/18, but some scary pitbulls on the trail growling, running at you, and barking. Not cool at all.